The exterior of the home boasts plenty of charming Craftsman features, including a columned front entry, a large front porch, and exposed rafter tails. As you can see, the home also has plenty of windows that fill every room with natural light! Right off the large porch, the front door leads into this charming and spacious entryway. The room features a large window seat with plenty of built-in storage underneath it - perfect for keeping the space nice and tidy. The color scheme in the kitchen is light and bright, with white marble countertops and white cupboards. Hardwood floors, stainless steel appliances, and the dark wood base of the kitchen island keep the space from feeling washed-out. 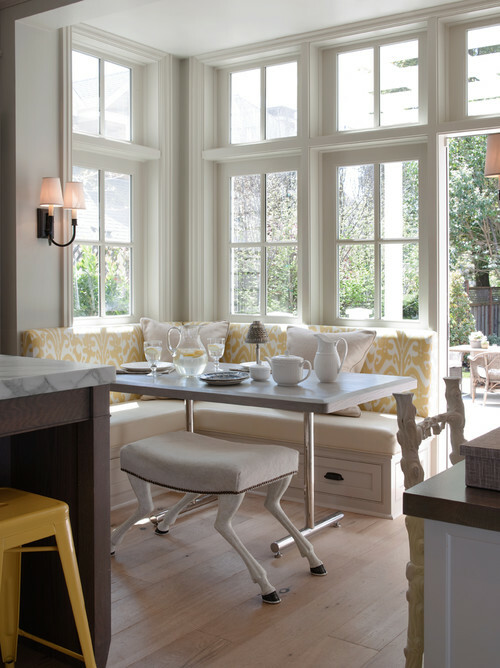 The family enjoys their meals in this adorable little breakfast nook, which is surrounded by large windows. The banquette seat offers plenty of built-in storage, and the door on the right leads out to a large patio. With plenty of windows and natural wood, the cozy living room has an elegant yet relaxed feel to it. A fireplace can be found behind the chair on the left, and the mirrored cabinet behind it cleverly hides a flat-screen TV. The family room is small and comfortable, with a large sofa and plenty of cabinets for storage. Double glass doors flood the space with natural light and open onto the large front porch. 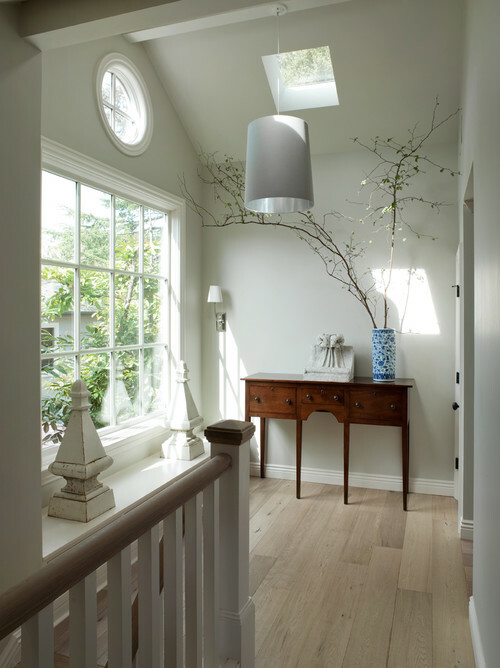 At the top of the stairs, vaulted ceilings and a skylight make the space feel open and inviting. A hallway leads to the home's bedrooms, while the large paned window overlooks the front yard. The bedroom belongs to the family's daughter, and it features high ceilings and an adorable circular window. Double French doors open onto a small patio above the breakfast nook, which was added to give the exterior of the home some extra appeal. 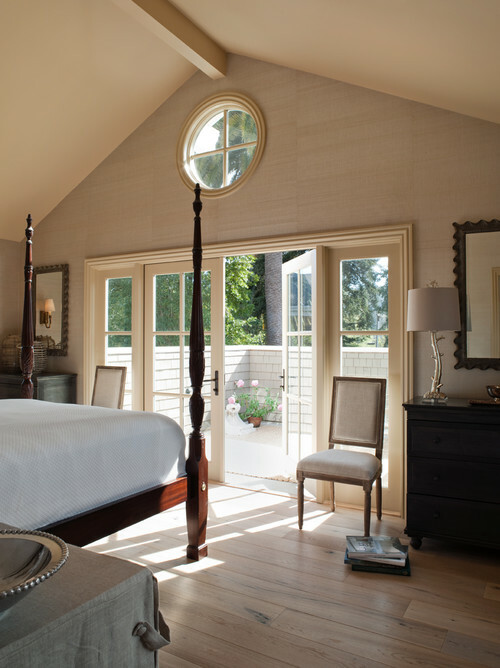 The master bedroom boasts a cathedral window as well as the same circular window seen in the bedroom above. Dark wood furniture lends the room a touch of elegance, and double French doors lead out to a private patio. With a calming color scheme and a free-standing bathtub, the master bathroom is an oasis of tranquility. The dressing table bench is an antique piece, while the unique pendant light hanging from the ceiling gives the space some flair. Last but not least, this powder room is tiny but charming. 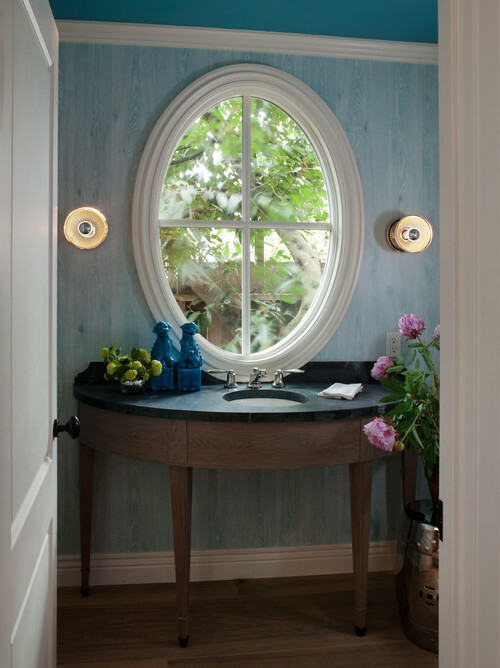 Instead of a mirror, the designer chose to insert a large oval window that provides a beautiful view of the lush greenery outside. Do you love this amazing home as much as we do? Let us know in the comments on Facebook, and be sure to share this article with your friends if you loved it!